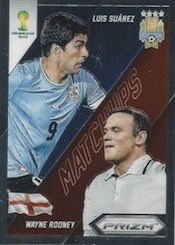 2014 is a busy year for soccer cards. 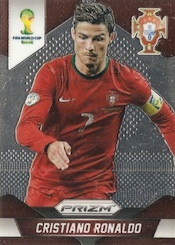 2014 Panini Prizm World Cup Soccer brings the card maker's signature chromium line to the biggest sport's tournament on the globe. 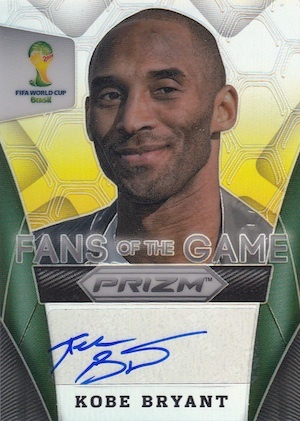 Featuring a broad checklist of international stars, highlights include several Prizm parallels and an autograph lineup that has many of the game's greats. 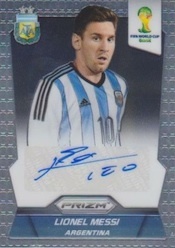 The 2014 Panini Prizm World Cup Soccer base set has 200 cards. All 32 countries in the tournament are represented. Shiny Prizm parallels include Prizm, Blue (#/199 or less), Red (#/149 or less), Purple (#/99 or less), Green Crystal (#/25 or less), Gold (#/25 or less), Gold Power (#/5 or less) and Black (1/1). Multi-color Prisms can also be found for base cards and some inserts. Collectors can also find Red, White and Blue, Blue and Red, and Yellow and Red versions of select cards. 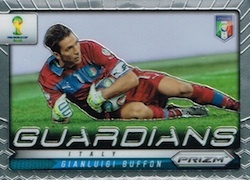 Protect your 2014 Panini Prizm World Cup cards with Ultra Pro toploaders. 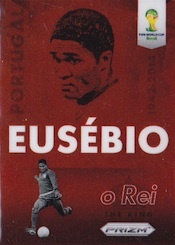 Autographs feature some of soccer's top names from day and the past. Pelé, Lionel Messi, Cristiano Ronaldo, Clint Dempsey, Robin van Persie and Tim Howard are among those lending their signature to the product. Besides basic versions, autographs come with Prizm (#/25 or less) and Black Prizm (1/1) parallels. As the name suggests, Combo Signatures come with two autographs. These are extremely rare. 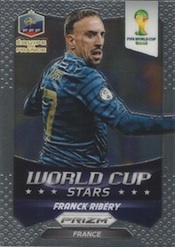 2014 Panini Prizm World Cup Soccer has a handful of basic inserts as well. World Cup Matchups have two star players who might cross paths in Brazil. World Cup Stars looks to previous tournaments for standouts. Both of these inserts have 11 Prizm parallels. 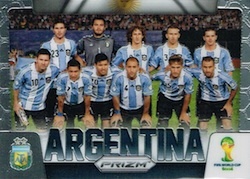 Team Photo includes a group shot of all 32 teams participatig in the 2014 FIFA World Cup. 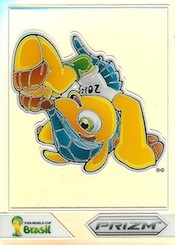 Fuleco, the tournament's mascot, appears on a short print that lands about two per case. 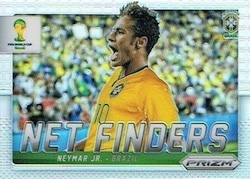 2014 Panini Prizm World Cup Stars Blue & Red Wave Prizms #7 Neymar Jr Brazil Jr.
Panini 2014 World Cup Prizm Maunel Neuer 59 199 Blue! 201 cards. Shop for base sets here. Click here for a full visual guide to all the pack-pulled Prizm parallels. 50 cards. Click here for a detailed guide and gallery. The auto checklist for this product is amazing! Hopefully the product does well. Panini has not confirmed yet if there will be at least one autograph per box. With the heavy price point one would expect at least two to four autopraphs per box which will retail for over 100 bucks! the auto checklist is SICK!!!!! Some of whom never signed before this product should do well with 6 autos per case on avg. The 10 parallels per box is AWESOME!!!! My LCS told me that autos will be 1 in 2 boxes, so if that is true, then they will sell at a premium and should mostly be big names. The parallels will also have to sell well in order for this product to be a huge success. Also heard that the Combo autos would be 1 per case. ^ if it’s correct, it’s very nice!! Duals will be very rare, nowhere near 1 per case, there are only a hundred or so in total. From the list above looks like only 200 dual signature cards…100 regular and 100 prizm cards. How sweet would it be to pull the Pele/Ronaldo! Great product, amazing list of autos and already selling great. Great job Panini as always!!! It is too expensive and not available in retail, i.e. Target, Walmart, Walgreens. Anyone know if the binder available has spaces for all of these cards? Not a soccer fanatic but follow it enough. Great product, although for the price (my hobby shop is selling boxes for $165!! ), not enough autos. Also, to answer a comment from FR above regarding retail, yes Walmart is carrying retail boxes, at least by me in NY. They are $19.99 and include 4 packs. Not sure if the inserts are different in retail as in the other sports, but to be honest I have had better pulls from retail than hobby. Either way, great product!!! I am a lifelong comic book geek who made the executive decision about a decade ago to drop card collecting. Just got too expensive to chase both. 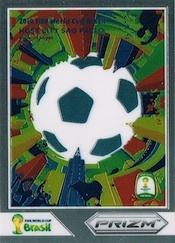 This Prizm World Cup set has single-handedly brought me back the joys of trading cards and the thrill of cracking open boxes. Awesome stuff! Bought 2 box and got an auto, a green, a gold power, and 4 purples combined. Since, I’ve already bought a couple of NFL boxes, and eyeing the coming NHL cards! Good to be back! The best cards I’ve ever collected. 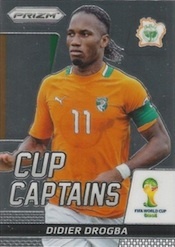 I’m a huge soccer fanatic and buying these cards was a no brainer. I bought 4 hanger boxes 1 giant hobby box,even though not any of those had any autographed card in it I still loved those great looking cards. 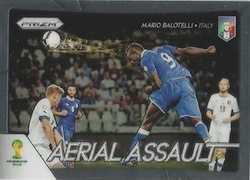 Best soccer card to date!!! Anyone giving this product less than 3 stars should stick to adrenalyn xl as most likely they are teenagers and have no money..